The Ramage, a wooden hand press with iron platen, was built in 1820 by Scottish-born Adam Ramage (see Ramage Screw). 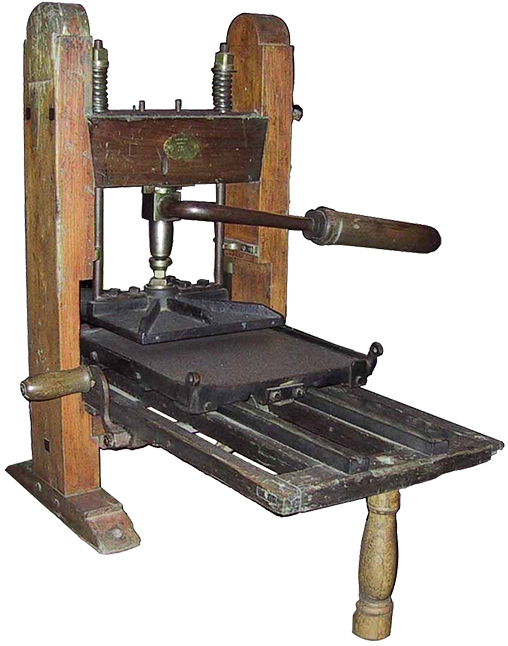 The tabletop Ramage, at 38″ high, is the smallest of the three sizes of presses built by Ramage: a full-size common press; an intermediate free-standing press which Ramage called his “screw press” (see Ramage Screw); and the foolscap, so named for the size of sheet that it would print. Foolscap presses were sturdier than the larger screw presses and sold for around $65. After Ramage’s death in 1850, the Ramage foolscap presses were made for some years by Ramage’s successor, Frederick Bronstrup. The press shown is missing its tympan and frisket.